Soldiers - as documented from as early as the Napoleonic Wars - have always made decorative or souvenir objects in their spare time. During World War I, to relieve boredom in convalescent hospitals in Britain and France, soldiers recovering from wounds or illness were encouraged to make a variety of handicrafts. This practice was carried on throughout World War II as it kept the soldier active and was also believed to be of therapeutic benefit. Corporal Neville Parramore was discharged from the army in February 1945, after 1719 days active service (930 on foreign shores). Neville began his military career as a Rat of Tobruk, but in 1942 was transferred with his unit to Papua New Guinea. Whilst fighting in Milne Bay, Neville suffered a great deal from malaria, and was often left out of battle (LOB) on light duties. To pass the time, Neville was encouraged (probably by Red Cross workers) to undertake some art or craft activity. 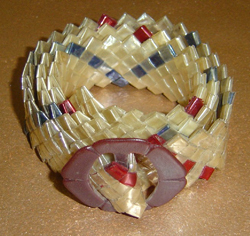 Whilst a convalescent at Milne Bay, Neville skillfully plaited a number of belts using the cellophane wrappers removed from cigarette packets. To the finished product, he added a Bakelite (or early plastic) buckle, however this may have been done when he returned home. The belts created by Neville were worn by family members, and today, this is the only example known to have survived. The plaited belt is of historic significance as the only object held in the Museum's collection which relates directly to the wartime experiences of Neville Parramore. It complements the large collection of items from the Blaxland and Parramore families, and is one of the few objects with provenance to a male member of the family.